Sometimes the creepiest things aren't malevolent and grotesque, but cute and sweet... and a recent art exhibit proved it. The "Cute and Creepy Art Exhibit" confronted us with terrifying fluffy animals, and alarming children. What could people do except dress up in their greatest gothic finery? "Cute and Creepy" was curated by Carrie Ann Baade, at Florida State University School of Fine Art. The Grand Opening was Friday, October 14. It was a huge success with many attendees in costume & even circus acrobats! Check out some more gorgeously weird art below. 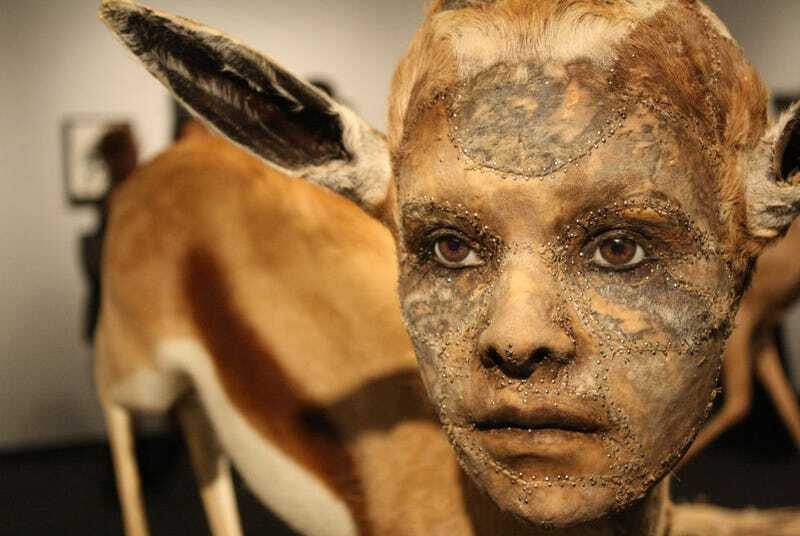 Feral Children, Skeletal Animals and more. Strange animals, three-legged beasts, trapped mermaids, and hand-heads.